“I long to see you, that I may impart to you some spiritual gift to strengthen you—that is, that we may be mutually encouraged by each other's faith, both yours and mine” (Romans 1:11-12). My first visit to Brazil was in 1998, when Richard Denham invited me to preach at the FIEL conference (mentioned in my last blog). It was during this conference that I was invited to preach at the first Reformed conference among the Presbyterians in the northern state of Amazonas in 2000. I still vividly recall Pastor Jaime Marcelino (picture below), pastor of the Presbyterian Church of Cidade Nova in Manaus, coming to me at the end of the FIEL conference and giving me a gift of Brazilian snacks prepared by his wife. With a very soft unassuming voice an d looking very timid as he pieced a few English words together, he asked for my contact details and told me “not to worry” but to accept his wife’s gift. He said that he would want to invite me to come back to Brazil to preach for him at a new conference in his church. I carried the home-made gift all the way back to Zambia and shared it with my family. Sure enough in 2000 he invited me to preach at the very first Encontro da Fe Reformada (Encounter the Reformed Faith) conference. It was the first conference of its kind among the Presbyterians in Brazil, drawing its inspiration from the FIEL conference. I got another invitation in 2002. 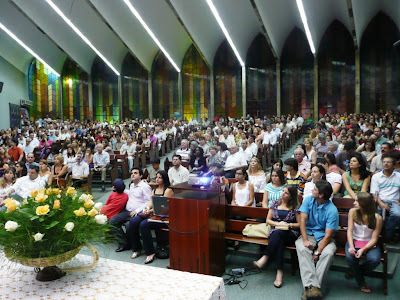 In 2003, the Encontro da Fe Reformada conference grew into two conferences and was not only held in Manaus but also in Goiania at the First Presbyterian Church (Pastor, Joer Correia Batista, picture on the left). The following year, I had the opportunity to participate in both the Goiania and the Manaus conferences for the first time and was greatly encouraged to see the growth of these two conferences. Other international preachers who have preached at these conferences include Iain Murray (see his report) and Brian Edwards from the UK. 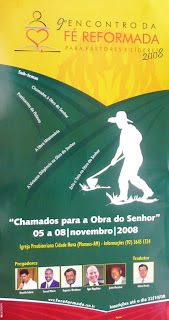 Although I was back in Brazil twice in 2006, both visits of that year were with newer and smaller Reformed conferences (also among Presbyterians). One visit involved two conferences in Fortaleza and Sao Luis, and the other was a conference in Salvador. This year, the Encontro da Fe Reformada conference had its 9th gathering in Manaus and its 6th gathering in Goiania. I had the inestimable privilege of being invited back to preach at both conferences. The conference organizers also paid for my wife to come along with me, and we both thoroughly enjoyed the visit. The hospitality provided by all our hosts was really “worth writing home about”. How can one forget the Brazilian meals served by the wives of Pastor Jaime and Elder Erivelto to all the speakers and guests from afar? I hear it is an annual tradition at the Manaus conference. For those of you who may one day visit Brazil, let me tell you about the special fish dish called "pirarucu a casaca" (Brazilian equivalent to cod, served in a tropical fashion with layers of bananas and manioc flour plus vegetables). And then there are the mouth-watering desserts made from unique Brazilian fruits like açai and cupuaçu. They are worth crossing the Amazon forest on foot and swiming across the Amazon river for! We had a similar meal with our hos ts in Goiania, Abe and June Berberian. These very tasty and nutritious meals enriched the excellent spiritual fellowship we had with the brethren. 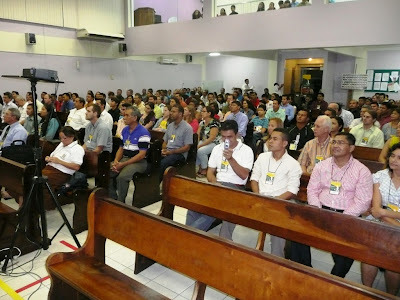 Conferences such as the Encontro da Fe Reformada play an all-important role in the progress of the Reformed Faith in any country. An obvious example is the Founders Conference among the Southern Baptists in the USA, which must be given some credit for the resurgence of a robust Calvinism among Southern Baptists in that country. 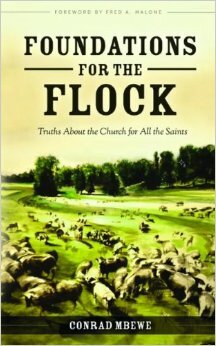 Churches and seminaries in that great denomination have been reclaimed to “the faith of our fathers” in an extraordinary way. Brazil is no exception. Like the Southern Baptists in the USA, the Presbyterian Church of Brazil has seen its best and worst times. With a membership of about half a million, broken down into sixty-eight synods (compare with Zambia which only has one synod), it must be obvious to anybody that this is indeed a big denomination. Over time, it had become a mixed grill, with the Reformed Faith being at its lowest ebb. However, it is very clear that these conferences are becoming a rallying point for those who want to see their denomination return to its historic position. In 2001, some local scholars who held on to the historic Reformed position (like Augustus Nicodemus and Mauro Meister) were expelled from the theological faculty of the Andrew Jumper Post Graduate Center that exists side by sidewith Mackenzie Presbyterian University, and is maintained by Instituto Presbyterian Mack enzie. 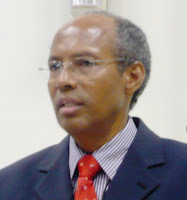 However, all that has since turned around and they were not only restored in an astonishing General Assembly, in 2002, when the conservative wing of the Church elected the new moderator and denominational officers, but—as you will notice from their present positions mentioned below—they are now all in key spots in Mackenzie educational institutions with its post-graduate school (the Andrew Jumper Post Graduate Centre). Again, like the Southern Baptists in the USA, those who are now at the helm of the number one ministerial training institution of the denomination are solidly behind these Encontro da Fe Reformada conferences. Thus on this trip, apart from preaching with other visiting preachers like Ronaldo Lidorio and Ageu Magalhaes, I also preached with Dr Augustus Nicodemus (chancellor of Mackenzie Presbyterian University and professor of New Testament), Dr Mauro Meister (professor of Old Testament, translating for me above), Dr Heber Carlos de Campos (professor of Systematic Theology) and Mr Solano Portela (the chief financial officer of the University and chairman of the The ological Training Board of the Presbyterian Church of Brazil that oversees the church’s eight seminaries and three official Bible Institutes of the denomination). 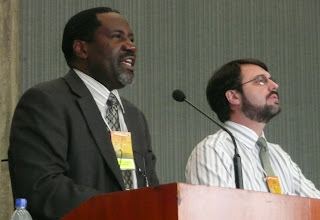 Previously, I have also preached with Dr Valdeci da Silva Santos (professor of Pastoral Theology). All these men are solid in their Reformed convictions and warmly evangelical. The humility of these men and their commitment to these conferences is amazing! For instance, Solano Portela (translating for me above) had to return to Sao Paulo for a day during the conference in Manaus in order to attend to some urgent business at the Mackenzie University. This necessitated a three-and-a-half hours flight each way (the distance is further than Lusaka to Cape Town). He interpreted for me in the evening, took an overnight flight to Sao Paulo, chaired a meeting the following day from morning up to midnight, and then flew back the next morning to come a nd continue interpreting for me at the conference! 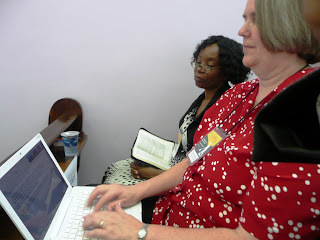 In the meantime, his wife, Betty (seen in action here), was translating all the sermons for Felistas and me, by typing them out on her laptop as they were being preached! 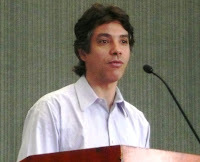 Also, a day before the Goiania conference started, news reached the organizers that my fellow speaker, Daniel Doriani (from St Louis, USA), could not make it. As soon as word got to the brethren in Sao Paulo, Augustus Nicodemus and Heber de Campos quickly made changes to their already-busy schedules and travelled over nine hundred kilometres to Goiania to rescue the situation. They both did an excellent job. Augustus’ three sermons on the first three chapters of James are the best expositions I have ever heard on that book; and that, despite the fact that I was hearing them through an interpreter! Another aspect I have found challenging about the Brazilian conferences is the role played by the members of the local churches that host them. In Manaus, Pastor Jaime Marcelino asked those in the organizing team to come forward at the end of the conference s o that their labours would be publicly acknowledged—and I counted no less than fifty members coming forward—fifty! Add to this the fact that many who were not necessarily in the actual organizing teams for the two conferences helped to sponsor the conferences financially. 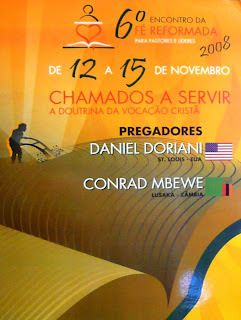 At the back of the folder given out to the conference participants in Goiania were no less than twelve companies, obviously owned by church members, which helped to sponsor that conference. Some paid for the air-tickets of the preachers, others took up the cost of all the tea breaks, others paid for those pastors who needed help, etc. This is truly a wise use of worldly “mammon” (see Luke 16:9-13). I am glad that this is beginning to happen in Zambia, but we still have a long way to go in this area. Before I “put my pen down”, I need to mention one more aspect of the conferences that I found most challenging. It was the area of books. 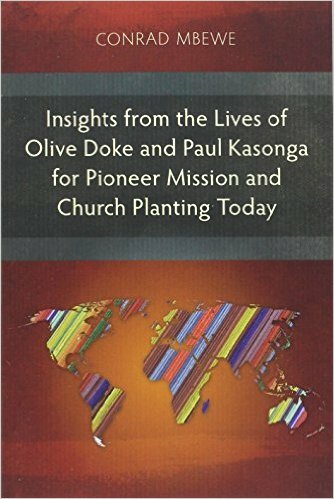 Making available the best books at the best possible prices must be the goal of all conferences that seek to see the Reformed Faith make progress in the land. 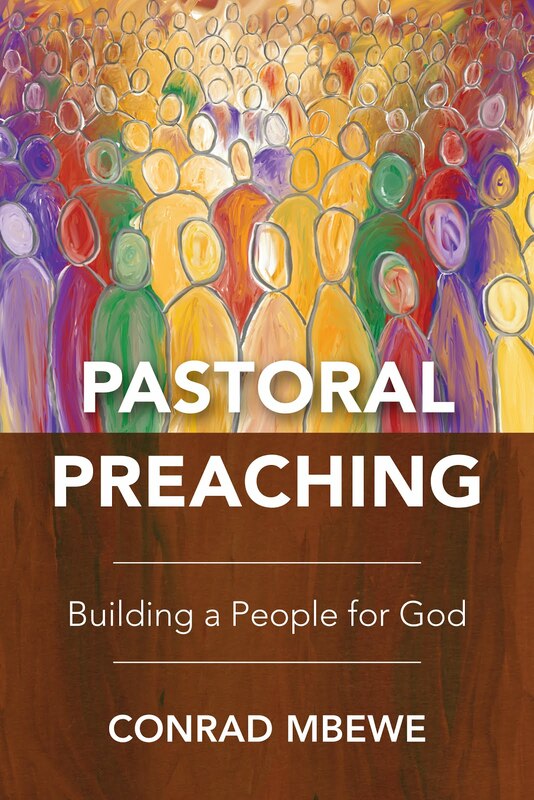 In this way, even when the conferences are over, the truths being expounded there are carried home not only in the hearts of the pastors but also in the books they have purchased. Brazil was no exception. The pastors and church leaders coming from various parts of the country for these conferences also came to stock up on their libraries. When the bookshops at both conferences were opened, a swarm of delegates besieged the books. Looking at the enthusiasm with which the books were being snatched up, one would have thought they were being given out free, but they were actually being bought—albeit at reduced conference prices. 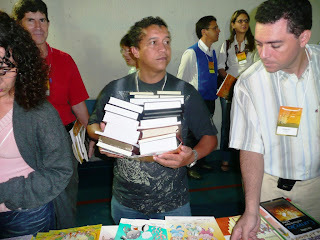 At the conference in Goiania, R$35,000 (about K60 million) worth of books were sold. The smiles on the faces of the successful ones, as they went away with the booty, betrayed the satisfaction in their hearts. I long to see such a day in Zambia! Let me end by saying that I returned to Zambia with a heart enriched by the ministry of the brethren in Brazil, and can only pray that they were also enriched by my ministry. To borrow the words of Paul to the Romans, “I long to see you, that I may impart to you some spiritual gift to strengthen you—that is, that we may be mutually encouraged by each other's faith, both yours and mine” (Romans 1:11-12). I trust that this was fulfilled in the last two weeks as I ministered in Brazil. Although we may not all have the opportunity to visit Brazil, one thing we should do is pray for the brethren there as they continue to labour with all their might to further the Reformed Faith across Brazil. They have a mammoth task on their hands. I now set my eyes on my next international preaching engagement. 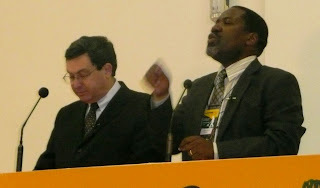 I am scheduled to preach in South Africa, at the Grace Ministers’ Conferences in January 2009. Please, remember me in your prayers as I prepare the messages and as I deliver them to the pastors in South Africa who long to see a better day in their land also. To God alone be the glory. Amen!